Mums in a flower market in the South of France. Photo courtesy of SuperStock. The North American staples used to liven up fading fall gardens with pops of color, have a different role across the pond, as Garden Variety’s European correspondent Mike Alexander explains. The chrysanthemum is a perennial that was first cultivated by the Chinese more than 2,500 years ago. Its name is thought to derive from the Chinese “chu hua” meaning October flower and such was its lofty status in that country that lower classes were forbidden from growing them in their gardens. The Japanese see them as being symbolic of the sun and consider their unfolding petals to be representative of perfection. There are countless varieties in nearly all shades and hues available, ranging from bright lime greens through deep eggplant purples. With such a rich palette of colors and a long vase life, they are often referred to as the florists’ best friend. But the mum holds a very different place in the eyes of French society. Here, the flower is symbolic of death and is used only on graves and at funerals. The first of November is la Toussaint or All Saints day and the day after, Le Jour des Morts or All Souls Day. This period forms part of an important public holiday in France usually followed by two weeks of school vacation. It is a time that people return to their ancestral homes from all over the country to reestablish family ties through the sharing of gluttonous meals and remembrance of the dead. Grave sites that have for the past twelve months been neglected and seemingly forgotten suddenly spring to life. Tombs are cleaned, prayers are said and candles are lit. 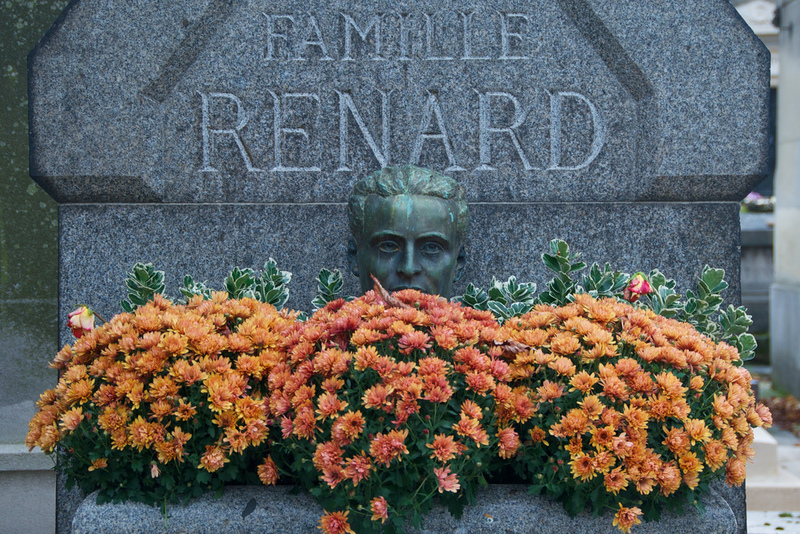 Chrysanthemums on a grave at Père-Lachaise Cemetery in Paris. Photo courtesy of Peter Cook. For a few brief days the chrysanth suddenly comes into its own. Areas where only days before little could be seen that was not somber and gray will burst into color as bouquet after bouquet of chrysanthemums are laid on and around burial sites by family members paying respect to their dearly departed loved ones. During this span, Père-Lachaise in Paris, one of the most visited cemeteries in the world, where notables such as Frederic Chopin, Oscar Wilde and Jim Morrison lie buried, becomes a popular tourist attraction, drawing more camera-toting visitors than Napoleon could have ever imagined when he first created the site in 1804. 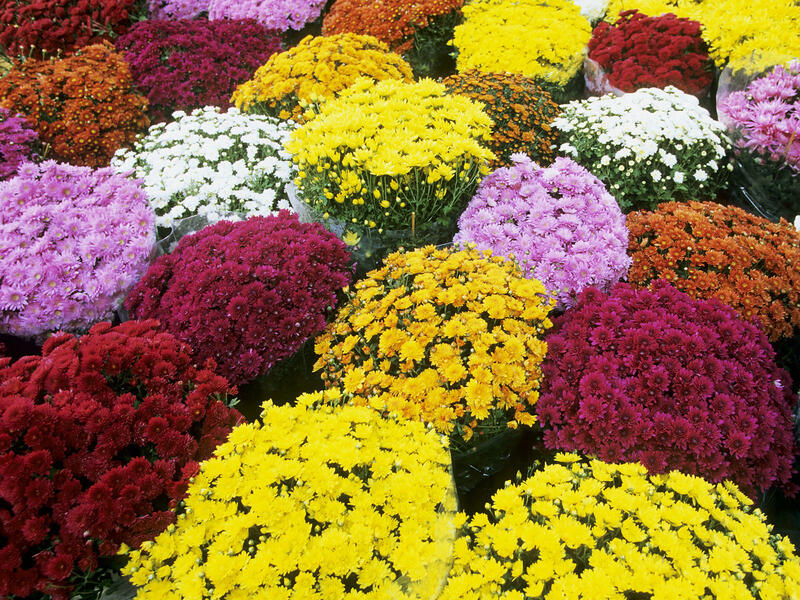 There are many nursery owners in this country who base their whole livelihoods on the production of just chrysanthemums. They spend all year carefully cultivating these flowers in a dizzying array of colors, all of which will be sold in just one or two short weeks. In France, it is common for those who visit friends to come bearing a gift, which usually takes the form of delicately handmade chocolate or a bouquet of fresh-cut flowers. I know of more than one newcomer expat here, who, unaware of mums’ national significance, has arrived at a French home with a beautiful bunch of these flowers in hand, leaving their hosts with thoughts of death and loss. This entry was posted in Fall Gardens, Flowers and tagged Chrysanthemums, fall flowers, France, French customs, funeral flowers, Mike Alexander, mums. Bookmark the permalink. I am so glad I can have these lovelies any time I take the notion!